Tuesday April 2nd 1901 I sewed most of the day. It was a very stormy day snowing and raining by spells. Dr McCords funeral was held this afternoon at the M.E church. Wednesday April 3rd 1901 Will went to town early this morning, he has another man to work now. The roads were so bad he walked. Ida and I gave the old kitchen a good cleaning up This is Brother Robs birthday. 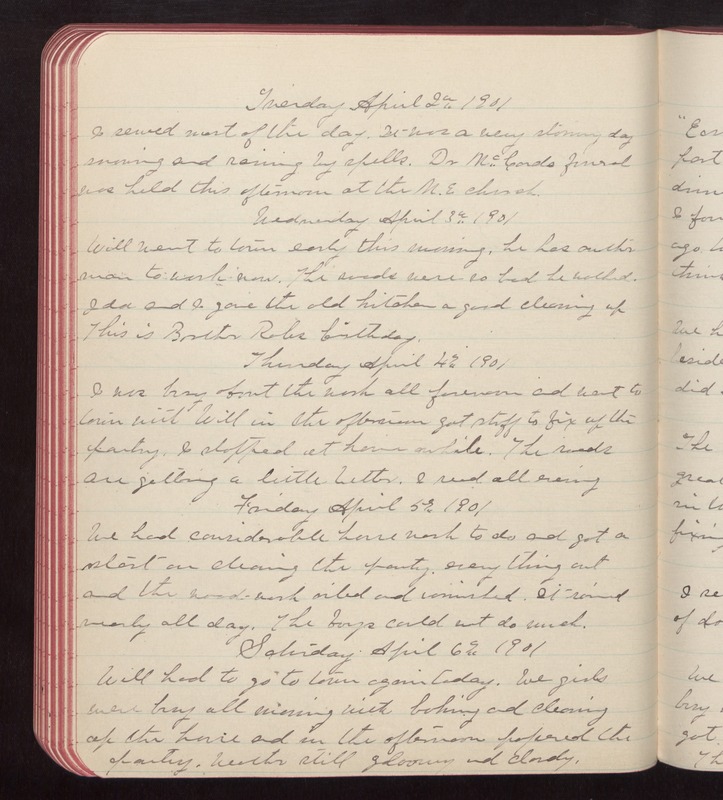 Thursday April 4th 1901 I was busy about the work all forenoon and went to town with Will in the afternoon got stuff to fix up the pantry. I stopped at home awhile. The roads are getting a little better. I read all evening Friday April 5th 1901 We had considerable house work to do and got a start on cleaning the pantry, every thing out and the wood-work oiled and varnished. It rained nearly all day. The boys could not do much. Saturday April 6th 1901 Will had to go to town again today. We girls were busy all morning with baking and cleaning up the house and in the afternoon papered the pantry. Weather still gloomy and cloudy.